If you want that amazing surfing holiday experience but don't fancy catching hypothermia in the icy Irish seas take it to the beaches of Portugal. David Coughlan did just that and found that the cold beer, warm waters and hot nightlife really did the trick. Despite what Christy Moore might say, 14 pints of stout are unlikely to improve your surfing technique. Staying upright is hard enough at the best of times, never mind with the help of a few ill-advised ‘steadiers'. But after spending more time dumped in the water than riding the waves, I'd be willing to try anything. Wipeout! In recent years Ireland has become a haven for surfers with the likes of Bundoran and Lahinch gaining a reputation for some of the best waves in Europe. However, given the icy temperatures off the western seaboard, many surfers are hitting the warmer waters of Portugal with Ericeira, just outside Lisbon, growing in popularity. The picturesque fishing town is just 40 minutes form the Portuguese capital and provides a perfect setting for surfers of any level to catch a few waves and sink a few beers afterwards. There are over 20 beach breaks along the Ericeira coast offering quality surfing for everyone from novices to fully-fledged Kelly Slater wannabes. So after a couple of weeks watching Point Break and few practice sessions on the ironing board, I headed to Portugal's Atlantic coast to ride some tubes. Aer Lingus fly direct from Dublin to Lisbon and from March 14, 2009 will operate from Cork to Lisbon on Tuesdays, Thursdays and Saturdays. Any surfer worth their wax knows a bit of rest and relaxation is crucial after catching a few bubbles and Ericeira's self-catering Eco Lodges offer the ideal place to kick off the wet suit and soak up some rays. The six funky and ultra-modern wooden lodges surround an eco-friendly swimming pool with a large bbq area and a common room complete with pool table and entertainment system. Each lodge has an upstairs balcony and hammock with a kitchenette and plasma TV and uses solar energy and wood pellet boilers. And for those not so keen on hitting the surf, there's also a full bar and extensive wine cellar. There's even a small vegetable garden where the more culinary-minded can find some fresh produce to spice up their salads. Irish tour operator surfholidays.com offers accommodation packages for the Eco Lo dges as well as self-catering apartment and the four-star Villa Gale Hotel in Ericeira (check out the cocktails). A week long stay in the lodges, including six days of lessons, starts from €250 per person. 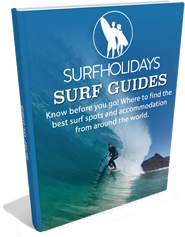 Surfholidays.com also teams up with the local Na Onda Surf School with three days of two hour lessons, including a wetsuit and board, setting you back just €59. Beginners can take their boards down to Foz do Lizandro or Praia do Sul, both of which offer great beach breaks for those starting out on a Surf holiday Portugal. my pro-surfing dream may be some way off yet. There are plenty of options for intermediates with the reliable and safe reef break at Ribeira d'Ilhas, while the more adventurous will be tempted by the world class Coxos. Up the coast is Santa Cruz, with the world renowned Supertubos further on at nearby Peniche. Kite and windsurfers are well-catered for too with Praia do Guincho near Cascais within a half hour's drive. After failing in my bid to ride the giants, the only sensible option was to repair to a few local hostelries and Ericeira offers plenty in the way of nightlife. Check out Canastra for some local seafood or Tik Tak for a nice juicy steak before hitting Ourico nightclub to show of those funky moves. If you fancy a few of the delicious local beverages La Luna and Pedro Pescadora are well worth a look, especially with beers there setting you back a recession-busting €1! Ericeira is just 40 minutes by car from Lisbon where anything from top soccer action with Benfica and Sporting Lisbon to shopping and culture is available. The UNESCO World Heritage town Sintra is also nearby, as is Estoril, home of the world famous casino where Ian Fleming gained his inspiration for Casino Royale. There are also plenty of options for any keen golfers, including the PGA Championship course Penha Longa. You won't be bored on or off your board on this break.